Please measure your bed to ensure that this quilt fits your bed properly! This bedspread set is made of 100% cotton using superior materials. We found this combination to be the best for durability and texture. We hand washed our quilts three times to ensure material integrity. We use the traditional world famous Hawaiian quilting stitch/appliqué method. This is a brand new, 100% HAND QUILTED and HAND APPLIQUÉD, NOT MACHINE EMBROIDERED bedspread. It fits on a King or Queen size beds with two matching pillow shams. Add some Hawaiian style and bring Aloha to your home. Our quilts makes a great conversation/centerpiece to any home and also it makes a terrific gift for any special occasion! Hey Buddy!, I found this information for you: "Crown and Kahili Bedspread RE". 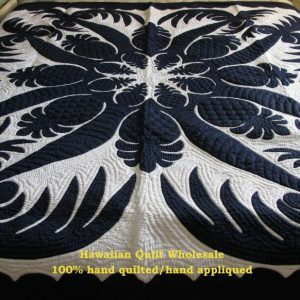 Here is the website link: https://www.hawaiianquiltwholesale.com/product/crown-kahili-bedspread-re/. Thank you.